Marissa's spell was almost complete, she was unaware of what was happening behind her. She turn her head then froze, she saw someone, someone she hoped was lost in her path forever. "You," she said with a glare. The figure looked up quickly, not expecting to be noticed, then said, "Marissa, did you really think it would be this easy to hide it?" "Get way from her or I swear I'll make you regret it," Marissa warned him. "I see...." he said in a calm voice. Causing him to land on the floor. but as soon as she was close enough she was grabbed flipped over his head. and came crashing down to the floor. He raced over and grabbed the nutcracker. Marissa ground as she rolled over, a sharp pain ran up her spine. She saw him run for the fireplace, she knew exactly what he was going to do. She knew she had to stop him. She forced herself off the floor and made a mad dash to grab the nutcracker. She grabbed it just in time and pulled with all she had. They pulled and spun each other around the room in a desperate fight for the nutcracker. An evil smile grew on his face. Marissa knew immediately that something was wrong. 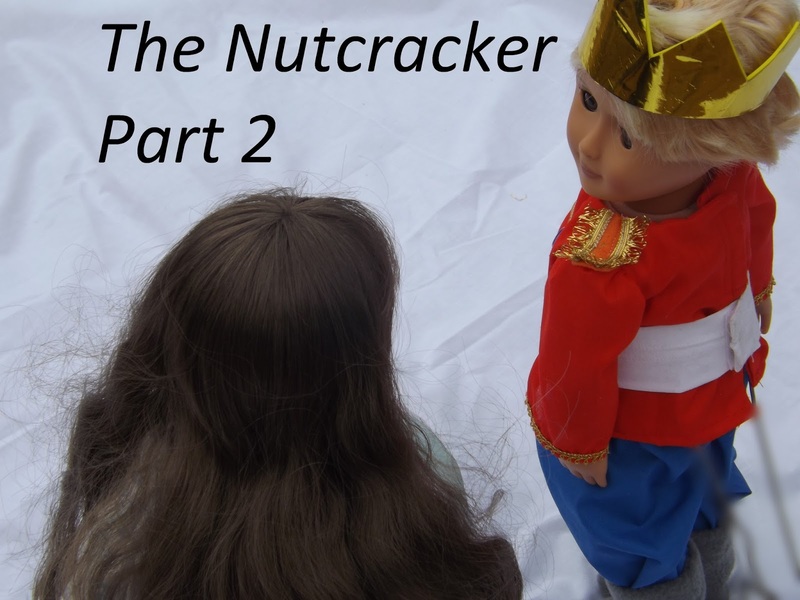 and was brought harshly to the ground, while an evil person walked away with the nutcracker. He laughed at her and said, "I don't even know why you keep trying, you'll never break the spell. Your land is doomed. I, The Rat King, I'm going to take your land! And all I have to do is to destroy this,"
"And he'll be gone forever,"
"No!!" Marissa screamed as she finally broke free of the mice' grip. Catching the Rat King off guard, she was able to rip the nutcracker out of his hands. And in desperation she threw the nutcracker at the enormous tree. Before being brought to the ground by the Rat King. "I'm done dealing with you! Say goodbye Marissa!" The Rat King hissed. 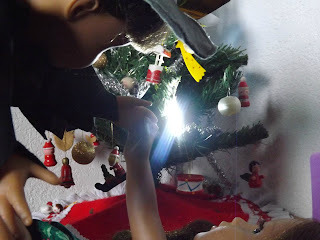 Suddenly the clock struck midnight, and a huge flash of light came from behind the tree. Marissa knew exactly what happened. She threw him over her side and jumped to her feet. "The spell is broken! The spell is broken! Marissa screamed at him. "Our land as been saved! You shall never take us down!" "Seize her!" He commanded his mice in anger. She held up her cape in front of her. And when she dropped it she was gone. The very confused mice picked up the cape, trying to figure out where she went. "You let her get away?!?" the Rat King yelled as his mice dropped the cape and ran. He picked up Marissa's cape, all that remained of her. Then threw the cape across the room in anger. Suddenly something sharp touched his back. "So you figured it out huh? Well I'll still win," the Rat King told him. "You're surrounded and out numbered, so while you may have broken the spell your highness, you still can't win," the Rat King told him as his mice approached. And two toy soldiers sprang from the box. They marched out and surrounded the mice. "Well," the prince said, "It looks like the odds are even,"
"Then let us have a real fight," the Rat King said. "Let us finish this,"
I slowly opened my eyes, only a little at first, then my eyes grew wide. I leaped up to my feet and franticly looked around. I couldn't believe what I was seeing. I was trapped in a war I knew nothing about. I looked to my left and noticed someone, there was a boy and a rat fighting each other. The boy seen to be somewhere near my age, and somehow he seemed familiar, but I don't know what. They fought right in front of me, their swords clang together repeatedly in a epic battle. knocking the sword out of his hands, and knocking him down too. "The one thing you fail to learn about battle, take one wrong step, and you don't get another chance," the rat told him, pointing his sword in his face. I had to think fast, he was going to kill him! So I did the only thing I could. I jumped on his back, startling him into dropping his sword. I was thrashed back and forth brutally, I held on as best as I could until I just couldn't hold on any longer. I flew across the room, then hit the floor with a tremendous thud. I groaned as I tried to catch my breath. I rolled over to see him standing over me, with a sword in his hand. "That was a foolish mistake, one you won't have a chance to learn from," he said, holding up the sword. I tried desperately to pull myself away, but the chair blocked me from going any further. And stabbed him with the sword the rat dropped when I jumped him. I gasped before the boy ran over and pulled me away. When I looked back the rat was on the ground. He was dead, but I still had no idea what was going on. The mice froze, then ran over. They grabbed the rat and carried him away, but to where I don't know. What is going on? The words kept repeating in my head. After the mice left the soldiers jumped back in the box, then disappeared. The boy walked over, he picked up his sword and slid it back into his belt. But I didn't say anything, I just stared ahead in confusion and disbelief of what just happened. He picked up my night cap and walked over to me. "Is this yours?" He asked kindly. "Yes it is, thank you," I said as I took my cap. "You saved my life, thank you," he told me. Then suddenly it hit me, "Yo-your my nutcracker, but I don't understand. What happened? Why were there giant mice in my living room? And why is my tree so tall I can't even think of a measurement to describe it?" He smiled a little and said "Follow me, I'll explain on the way,"
So I put my cap down and followed. He ran his hand down the side of the fireplace. Then I herd a click. To my surprise he pulled the fireplace away from the wall, and behind it was some sort of tunnel or passageway. My jaw dropped in amazement. He gestured me to go ahead. So I took a deep breath, and I stepped through. I only took a step, and I was in a whole another world... A world covered with snow and ice. "It's so beautiful," I whispered. "It is isn't it... There isn't very much snow today but yet it's still amazing," he told me, "It's funny, I use to come here a lot, and now that I've been away so long that I appreciate it more." "So, what did happen?" I asked slowly. He took a deep breath, then began his story. "My family rules a land not far from here, it was my father, mother, and me." "The Rat King had been trying to take over our land for years, he heard legends of riches in our mountains. He wanted to take our lands and use our people to mine for riches that may not even exist. He threatened all the many lands, but wanted ours the most." "So he attempted multiple times to take over and failed. When I was about five or so, he decided to destroy us from within.... He killed my father, in hopes that my mother would just give up, but she didn't,"
"A few years later he decided to go after me, our castle was heavily guarded after my father was killed. So instead of doing to me what he did to my father, he cast a spell on me. It moved slow though, my second hand did everything she could, but nothing worked,"
"What's a second hand?" I asked.
" A second hand is someone appointed to help raise you, teach you the laws, and prepare you for the throne. She was a magician too though. I don't really remember much after that, the last thing I remember was my second hand trying to get a girl who I was suppose to marry someday to help, but she refused." He told me. "Wait, you're set to be married? How old are you?" I asked surprised. He smiled, probably assuming that that's not the way it works where I come from. "Well, probably not anymore, but yes, I was. It was set by our parents when I born,"
"Wow, so I guess I should call you your highness?" I said to him. He laughed and said "No, you can call me James,"
He was very nice, and cared about his people very much. I never imagined a Christmas gift could be so magical. We talked for a long time as we walked through the snow. Suddenly I felt something brush my arm. "What was that? Who's there!" I called out. I hope you enjoyed part 2! Ok, before I go I just wanted to let you know about The Christmas Photo Contest we holding right now, so if your interested then please go check it out! And also sometime after the third part of The Nutcracker we'll be having a Q & A's post with the cast! So if you have any questions for me or the cast then please go ahead and ask! But no asking my age, phone number etc (You only want that info so you can meet my dolls and not me don't you? How dare you! LOL JK ;) ) . Have a wonderful day everyone! Oh, I just meant it as a normal question. KATIE! This is SO cool! You are so imaginative, and I am loving this so far! No problem! Hey, also have you checked out the answers to the Q&A with the 30's? It's up again! This is a really great story - you have a wonderful talent!! I'm so glad you like it! Awe thank you! I am enjoying this so much, Katie! Amazing job! Awe! I'm so glad :) thank you so much!